1863 - 1872 H.M. Kamehameha V, By the grace of God King of the Hawaiian Islands. b. at Honolulu, Oahu,11th December 1830, as Lot Liholiho Kapuaiwa Kalanimakua Kalanikapuapaikalaninui Ali'iolani Kalani-a-Kekuanao'a, fourth son of H.R.H. Princess Elizabeth Kalani-Ahumanu-i-Kaliko-o-Iwi-Kauhipua-o-Kina'u Ka'ahumanu II, Kuhina-Nui, by her third husband, H.H. Prince Mataio Kekuanao'a, Kuhina-Nui, PC, KGCK, educ. Chiefs' Children's Sch., and Royal Sch., Honolulu. Adopted by King Kamehameha III and Queen Kalama after the death of his mother in 1839. Raised to the title of Prince and granted the style of His Royal Highness. Lieut-Gen of the Forces and Principal ADC to King Kamehameha IV 1855-1857, Minister of the Interior 1857-1863, Presdt Hawaii Graziers' Assoc 1856-1863, and Comptroller of the Royal Household to his brother. He travelled extensively overseas together with his younger brother Prince Alexander Liholiho, including to France and England in 1849 and the United States in 1862. Proclaimed King on the death of his younger brother with the reign name of Kamehameha V, 30th November 1863. Promulgated a new Constitution granting limited suffrage, 20th August 1864. Received the Duke of Edinburgh in Hawaii 1869. Founder and Sovereign Grand Master of the Royal Order of Kamehameha I in three classes on 4th April 1865. Rcvd: GC of the Orders of SS Maurice & Lazarus of Italy (1865), Franz Joseph I of Austria (1870), etc. He d. unm. at the 'Iolani Palace, Honolulu, Oahu, 11th December 1872 (bur. there in the Kamehameha Crypt, Royal Mausoleum, Mauna 'Ala, Nu'uanu Valley). 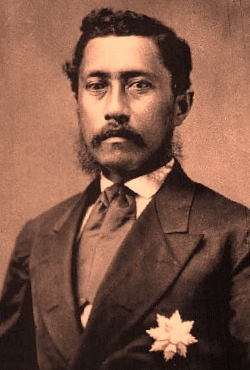 1872 - 1874 H.M. William Charles Lunalilo, By the grace of God King of the Hawaiian Islands. b. at Polukaina, Honolulu, Oahu, 31st January 1835, only surviving son of H.H. 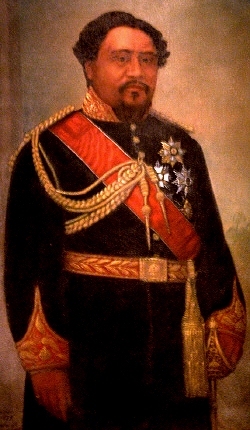 Prince Charles Kana'ina, PC, KGCK, by his wife, H.R.H. Princess Miriam Auhea-Kalani-Kui-Kawekiu-o-Kekauluohi-Keali'iuhiwaihanau-o-Kalani-Makahonua-Ahilapalapa-Kai-wikapu-o-Kaleilei-a-Kalakaua Ka'ahumanu III, Kuhina-Nui, only daughter of Alii Kala'imamahu, Chief Priest of Io and Kane and elder brother of H.M. Kamehameha I the Great, King of the Hawaiian Islands, educ. Royal Sch., Honolulu, Oahu. Elected unanimously as King by the nobles and representatives of the people of the Hawaiian Islands, in succession to his cousin King Kamehameha V, 9th January 1873. At the time of his accession, he was the highest ranking Alii of his generation. Installed at Kawaiahao Church, Honolulu, Oahu, 12th January 1873. Composer of the Hawaiian National Anthem "E Ola Ke Alii Ke Akua" (1860). He disbanded the Hawaiian Army after a mutiny against the then adjutant-general. Sovereign Grand Master of the Royal Order of Kamehameha I 1873-1874. Rcvd: KGCK (1867). He d.s.p. unm. from tuberculosis at Waikiki, Oahu, 3rd February 1874 (bur. in the Lunalilo Mausoleum, Kawaiahao Church, Honolulu, Oahu).